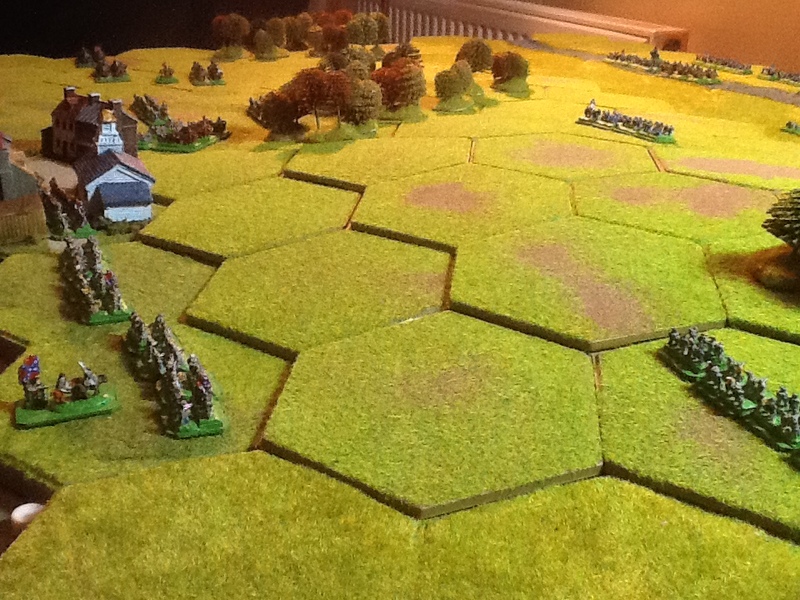 Although 21st October is most remembered in Britain as the anniversary of the Battle of Trafalgar in 1805, I have neither models nor rules for that fight, so I decided to have a go at the battle of Ball’s Bluff, 21st October 1861. I found a scenario online for the boardgame “Battlecry”, and prepared the battlefield with my Kallistra terrain. Laying put the troops I discovered I needed more Confederate cavalry, so off the the toy cupboard and paintbox. One very quick painting and basing session later and we are ready to go. An overview of the battlefield, taken with my i-pad. Union troops are drossing the Potomac in the background. Followers of my blog may notice from the closer picture below that my ACW models are not flocked to match the terrain they stand on, unlike most of my models. This is because when I started to base the troops for my Gettysburg battle some months back there was no time. It’s a job for another day. A view from the Confederate right flank. Terrain by Kallisra, figures from Irregular Miniatures, buildings by Total Battle Miniatures, trees by various makers. The battle began with the Confederates advancing on their right flank, which was countered by the Union cavalry, while also moving their infantry forwards towards the woods. The Confederates advanced into the woods to meet this attack, but were met by fire from the Union infantry. The cavalry of both sides charged and a general melee ensued. The Confederates pushed forwards in the centre, while the Union countered on their left. Confederate infantry and artillery in the centre fired with devastating effect. The Union forces then counterattacked but after several attacks and counterattacks were beaten back. On the flanks both sides took to the woods for cover and continued to fire with limited effect. Eventually Confederate firepower in the centre won the day. Although I enjoy the Commands & Colors Napoleonics games I found this version of the same basic game system to be a little too abstract. Not reducing the firepower as a unit incurs casualties is somewhat counterintuitive, and means that units are artificially strong until suddenly collapsing. Maybe that is more appropriate to the Civil War, but it does not work for me. So, while the table is set up, tomorrow I plan to replay the battle with other rules.